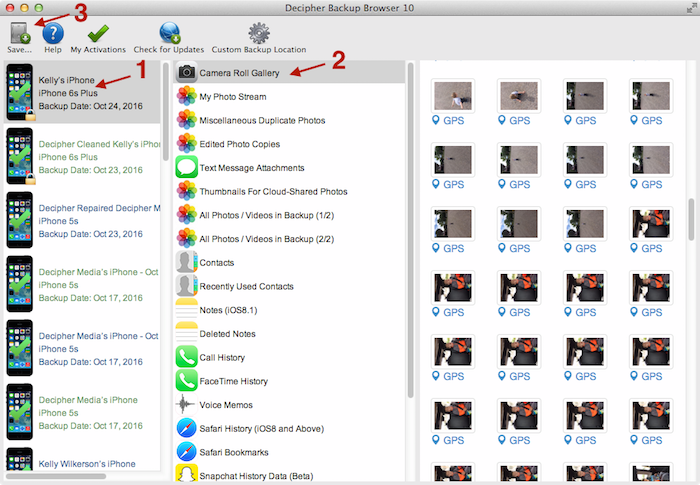 Select your iPhone backup and then select Camera Roll Gallery. Select a location to save the photos. Click on your backup, and then click on Camera Roll Gallery. Hold the Command key (macOS) or Ctrl key (Windows), and click the photos you want to export from the iPhone backup. Click on your backup and then click on Camera Roll Recovery. Select a location to export your photos from the iPhone backup. If you haven't installed Decipher Backup Browser yet, you'll need to download Decipher Backup Browser from our website.